Today is Day 5 of the tic tac toe dress blog tour! Until this Friday, you can receive 10% off the price of the tic tac toe dress (and all sewpony vintage patterns) with the code TICTACTOE10. Apply it at checkout in the sewpony vintage shop HERE. Use #tictactoedress to tag your creations. Today are three more lovely ladies who have sewn up my pattern. Zoe from Soulfed on thread, Kate from Katewillknit and Maarika from Liivi and Liivi. The first dress comes from Zoe - an Aussie Mum and blogger. She blogs from Soulfed on thread. She sews for her three kids and has helped me with testing twice now - for Miss Polly and for tic tac toe. Zoe was super helpful throughout testing and made two dresses for her little daughter. 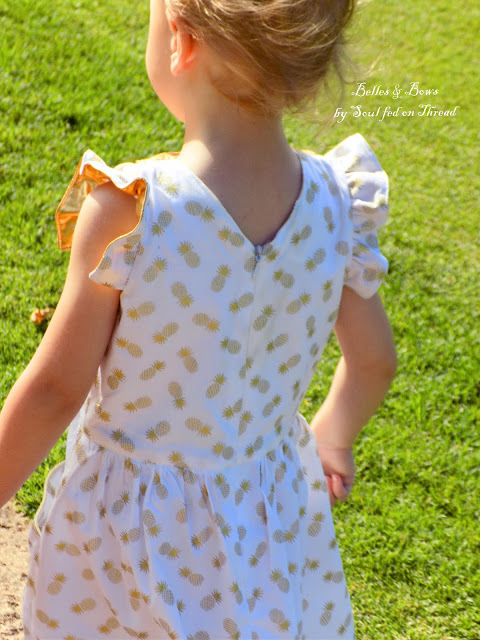 I love the pineapple cotton print she used for this dress. She is also sharing the first dress that she made over on her blog. Thank you Zoe! Kate is also Australian and blogs from katewillknit/needlestosay. She was so helpful in the testing phase and I was very glad to have her on board. She is sharing two beautiful tic tac toe dresses today over at her blog! 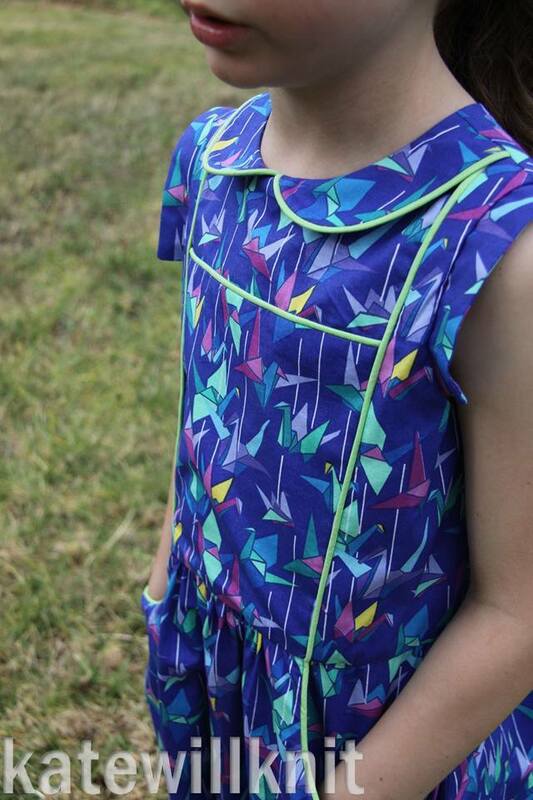 Kate chose gorgeous fabrics for her dresses and I just love her latest paper cranes blue dress! Thank you Kate! 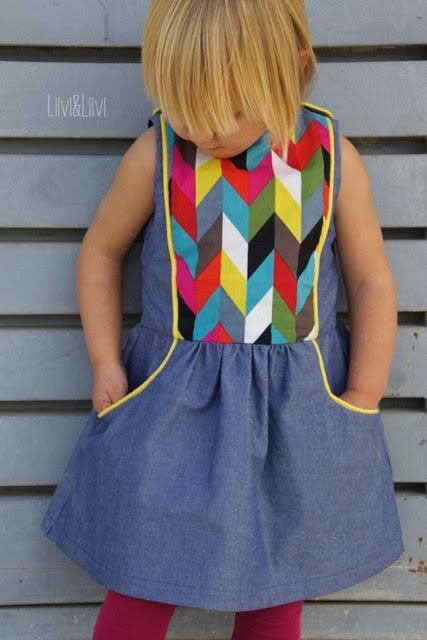 Lastly, Maarika from Liivi and Liivi, from Germany, is sharing her tic tac toe dress. Maarika has been a great supporter of sewpony and I really appreciate her beautiful sewing and encouraging words. She helped me with the German translation of Miss Polly and made so many gorgeous variations of this pattern. Today she is sharing a bright and cheery tic tac toe dress on her younger daughter, despite the fact that her kids have been unwell all week. Thank you Maarika - I love what you do!! Thank you so much for your time and creativity Zoe, Kate and Maarika! Be sure to come back Friday to see three more beautiful tic tac toe dresses!! Make sure to search #tictactoedress on social media to see more inspiration and don't forget to tag your dresses too! Click on the links below for the past posts to see all the beautiful tic tac toe dresses! This is just amazing, truly. Thanks so much for including me - not just in the photo, but in this circle of bloggers. She was so useful in the testing stage and I was exceptionally happy to have her on board. She is sharing two delightful tic tac toe dresses today over at her blog! Kate picked ravishing textures for her dresses and I simply adore her most recent paper cranes blue dress! Much obliged to you Kate!